Jeff Keller - Bass guitar: Jeff has played electric guitar for many years, but when Like Minds decided to create itself, Jeff picked up the electric bass, and has held down the bottom end of the rhythm section ever since. Jeff has tried many different basses over the years, but always comes back to the familiar feel of his Fender. Jeff and his family are Cincinnati natives, and have graciously hosted the rehearsal racket of the band. < Thanks Charlotte! > Musical influences are varied, ranging from blues to jazz to rock and in between. Influential artists include Ronnie Earl, Stevie Ray Vaughn, Carl Verheyen, and bassists Victor Wooten, Marcus Miller, Jaco Pastorious and John Adams to name a few. 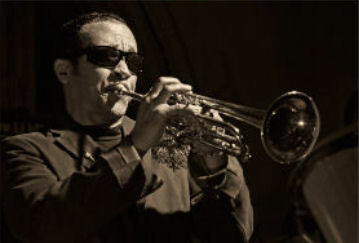 Rene Peters - Trumpet and percussion: Rene hails from New Orleans, and brings a great style of playing that blends New Orleans sounds with classical technique. Rene adds a whole new dimension to the band's sound. His lyrical playing adds a complimentary voice to music. Rene doubles on percussion when not playing trumpet. And Rene sings on selected numbers! Rene's musical influences include Weather Report, Return to Forever, Max Roach, Rush, The Neville Bros, Wild Tchopitoulas, The Meters, The Tonight Show Orchestra with Doc Severinson, Osibisa, ALL the New Orleans brass bands(! ), New Orleans Civic Symphony, Chicago Symphony, and all the music, food and art that "is" New Orleans! Ray Rissel - Guitar and Vocals: When asked for some bio info, Ray responded... "I was just recently reviewing my life... my musical life, in the wee hours of Sunday morning - 3:38 AM to be exact. I couldn't sleep. I was reading in the living room with my LED headlamp trying to finish this book so I can start the book that I really, really want to read when... the sound of a small airplane broke the quiet. Slowly flying southeast at a low altitude probably going to Huntington, Charleston or Roanoke. My mind ran amuck about all the possibilities, but as it faded out of hearing range I started thinking about the music and about playing on the road with the "Whiskey Creek Band" that I joined in 1976 after the rich influences I had the opportunity to have with the musicians I grew up with... and they grew up with. Bands like "The Times of Peace" playing Yardbirds, Young Rascals, Animals & Kinks. "Shadowfax" my high school band with drummer Kermit Kinne and bass player Bill Moore performing Zappa, Yardbirds, Cream, Hendrix and some originals. On to various groups with a variety of musicians from all over the Cincinnati area finally putting together the band "Cityfryed" with guitarist Barry Sebastian and drummer Mike Collins later to be replaced by Kermit Kinne. This was a progressive rock band that played some heavy arrangements of music from bands like Gentle Giant, Jeff Beck, Humble Pie, and a sprinkling of original material and a peppering of funk while entering the "fusion" era. Then the roadwork with the "Whiskey Creek Band" with Kermit's brother Pete Kinne. Based in Nashville and traveling all over the south playing rock & funk music. Kermit Kinne entered the picture again with this band. After the breakup of WCB, "Hot Shot" was on the road and funking out with drummer Tim Bare, singer Sherry Holt, bass player Albritton McClain and John Hurd on keyboards. The miles passed and the desire to become local prevailed and "Full Force" was born. Charlie King on lead vocals John Hurd keyboards, Mike Mitchell on bass and Daryl Adams on drums. "Full Force" had a pretty successful run of about four years in the Cincinnati area. Over the next decade I played with several bands including "Brimstone" with Doug Mayo and "The Driving Winds" with Carl Edmondson and Bob Armstrong. With an assortment of recording projects and constant involvement with music I'm delighted to find myself finally with "Like Minds." Life is full of surprises and wonder. . .
Barry Sebastian - Guitar: Barry started out playing in rock and blues bands. After hearing Weather Report in the early 70's, things took a turn, however. With a new perspective, his focus became melodic playing and a search for that unique "sound." Barry plays through a stereo configuration, providing a big sound, without the extreme volume of the "rock days." Influences are varied, including Jimi Hendrix, Bill Frisell, Pat Metheny, Alan Holdsworth, Larry Carlton, Jeff Beck, Johnny A, and many "unknown," but great players (and not necessarily guitarists!). Barry has also done original music CD projects such as Cantankerous (1999, with Ashley Williams), which made the number one spot on MP3.com in the electric blues category. So, how did this band come into being? Barry actually met Kermit in their college days at the University of Cincinnati. Kermit introduced Barry to Ray Rissel and it became evident that we were capable of some really good sounds! We played together in college bands doing covers of Hendrix, Doobie Brothers, Flash, The Eagles and some original material. Those days were bar band days, and the music was loud and our ears are still ringing. Kermit and Ray went on to tour for several years, while Barry stuck around Cincinnati, playing in original music bands, that were happy playing their complex music for a very limited audience. Along the way, New York harmonica player Chris Hammond joined the fray in Barry 's group, and the music started to return to the roots of the blues. But, there was a definite twist to how everything sounded... jazz lines with tight melodies driven by superb drummer, Mike Collins. 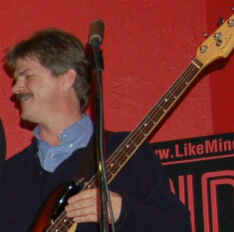 Eventually, Chris left Cincinnati to return to New York, but before leaving introduced Barry to guitar player Jeff Keller. Jeff contacted local radio blues show host, Eric Bisanko, who played blues harmonica, and with Jeff moving over to bass, a new four piece blues band was formed. Not long after the new group was formed, Mike left town, and Jeff, Barry and Eric joined The Bluehearts. 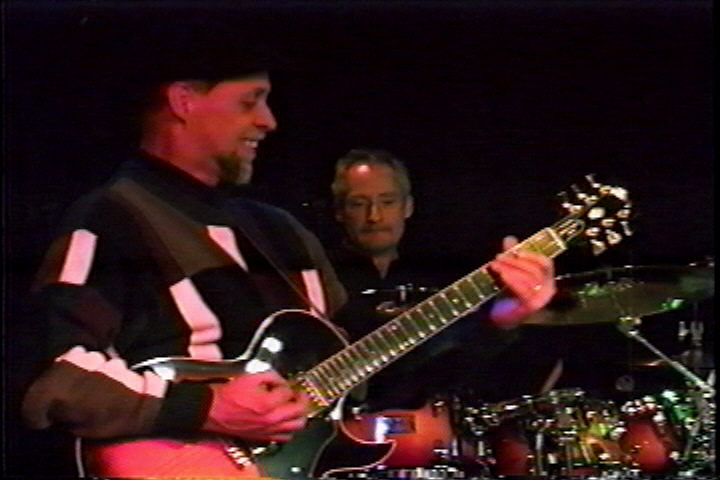 Jeff moved back to guitar, and the group played regular weekend dates for a year. Finally, with Mike Collins back in town, Jeff and Barry decided to hang up the blues and focus on jazz, as a trio. That was the beginning of the idea behind Like Minds. Barry had always wanted to play instrumental jazz and had finally found the means to do it. Barry and Jeff and Mike had a revolving door policy for musicians coming in and jamming. Horn players, keyboard players, you name it - many styles and influences helped form the band. Alas, real life issues sometimes take precedence, and Mike moved away. So, the search for a drummer was on. We took the suggestion of long time friend and guitar great, Ray Rissel, and contacted Kermit to see if he was available on drums. As it turned out, he was. With Kermit's addition, Like Minds was born. Kermit brought in Rene a year later, and the group matured into a tight four man lineup, playing jazz standards and jazz inflected covers of more familiar tunes. Then, in the summer of 2009, guitarist Ray Rissel joined the band, to round out the sound adding shades of rock and funk to give Like Minds its current edge. With three soloists, the possibilities are many! Like Minds' name stems from the feeling that we are like minded individuals when it comes to the music we make. It's a blend of many styles. It's tight. It's controlled. Yet, it flows with improvisation. The music takes on a life of its own, and moves from a whisper with space for the most subtle sounds, to the sound that is... Like Minds. Come hear for yourself!